Yesterday we looked at the Best Credit cards with a sign up bonus that have no minimum spending requirement. Today we will examine cards that maximize each of the different spending categories. And the nominee for best credit card for Airline tickets is: American Express Premier Rewards Gold. This card gives you 3X Membership rewards points per Dollar spent on Airline tickets. It comes with a $175 annual fee that is waived for the first year. Best Card for All Other Travel is the Chase Sapphire Preferred. 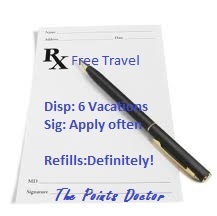 This card give 2X Ultimate Reward points per Dollar spent on all kinds of travel. That includes but is not limited to taxis, limos, trains, hotels, etc. Ultimate Reward points are considered by many to be the most valuable points currency as their points are flexible. They can be transferred to a number of partners and are easy to earn in large quantities by maximizing certain spending categories. You can also earn bonus points by shopping through the Ultimate Rewards Mall. The annual fee is $95 and is waived the first year. Best card for Gasoline is the PenFed Platinum Cash Rewards Visa. This card receives a 5% cash back on Gas purchases paid at the pump. It has no annual fee. Best Card for Restaurant spending is the Chase Sapphire Preferred card. Once again you receive 2X Ultimate Reward points on restaurant spending that can be transferred to other programs like hotels and airlines. IMHO, the best use of UR points is for Hyatt hotel stays. Hyatt has a very generous award structure that you can get as much as 7 cents per point. I wrote a post here about that. The annual fee is $95 and is waived for the first year. Best Card for Business Services is the Chase Ink Bold and Ink Plus. These cards are virtually identical. The Ink Bold is a charge card and the Ink Plus is a credit card. A charge card MUST be paid in full each month. With the Ink Plus credit card, you can make monthly payments, however anyone using this strategy for miles and points knows that interest and fees far outweigh the benefits of points. You can apply for both cards on the premise that there might be times when you want to be able to finance your purchases. (NOT!) Both cards provide 5X UR points on office supplies, wireless access, telephone and cable bills. I like to purchase gift cards every time I walk into an office supply store. There you will earn 5X UR points on gift card purchases. The annual fee for both these cards is $95 which is waived for the first year. I would sign up for both cards to get the 50,000 point bonus, then cancel one of them before the annual fee becomes due. Best Card for Advertising is the American Express Premier Rewards Gold. You earn 2X Membership Rewards (MR) points per dollar spent on Internet, TV and radio advertising. Best Card for Shipping is again the American Express Premier Rewards Gold. You receive 2X MR points for shipping services purchased in the U.S. for courier, postal, and freight. Tomorrow's Topic: The Best Credit Cards For Big Spenders. Is Bluebird Worth it Now? The Points Doctor is Dr. Bruce Wilderman of Artistic Expressions Dentistry http://www.MasterpieceSmile.com has been practicing Cosmetic Dentistry in the Philadelphia Area since 1986. He and his wife of 30 years enjoy traveling the world for little or no money using hotel points and airline miles given out by the banks and credit card companies. He wants to show you how to fulfill your travel dreams.